Parmigiano-Reggiano, called Parmesan in English after the French name for it, is a hard, granular cheese, cooked but not pressed, named after the producing areas near Parma, Reggio Emilia, Modena, and Bologna (all in Emilia-Romagna), and Mantova (in Lombardia), Italy. Under Italian law, only cheese produced in these provinces may be labelled "Parmigiano-Reggiano", and European law classifies the name as a protected designation of origin. Parmigiano is the Italian adjective for Parma. Reggiano is the Italian adjective for Reggio Emilia. The name Parmesan is used for cheeses which imitate Parmigiano-Reggiano, along with phrases such as "Italian hard cheese". Parmigiano-Reggiano is commonly grated over pasta dishes, stirred into soups and risottos, and eaten on its own. It is often shaved or grated over other dishes. Slivers and chunks of the hardest parts of the crust are sometimes simmered in soup. They can also be just roasted and eaten as a snack. The hollowed-out crust of a whole wheel of Parmigiano can be used as a serving pot for large groups. Parmigiano has many aroma-active compounds, including various aldehydes and butyrates. Butyric acid and isovaleric acid together are sometimes used to imitate the dominant aromas. Parmigiano is also particularly high in glutamate, containing as much as 1.2 g of glutamate per 100 g of cheese, making it the naturally produced food with the second highest level of glutamate, after Roquefort cheese. The high concentration of glutamate explains the strong umami taste of Parmigiano. 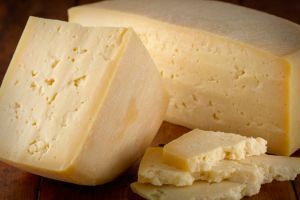 Parmigiano cheese typically contains cheese crystals, semi-solid to gritty crystalline spots that at least partially consist of the amino acid tyrosine.